Up until 20 years ago or so, the phrase "proper pitching mechanics" was implicitly understood to refer to those movements that allowed pitchers to throw, with control and command, while minimizing the risk of injury. 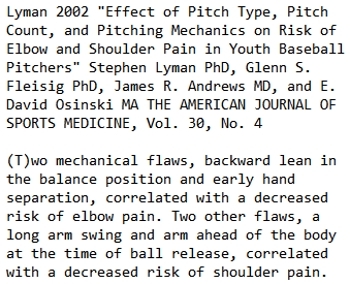 Nobody really talked about injuries, but the assumption was that nobody would teach pitching mechanics that significantly raised the risk of injury. The problem is that, due in large part to innovations like Tommy John surgery, that view of proper pitching mechanics has changed. Movements that reduce the risk of elbow and shoulder problems are now labeled as flaws. While positions like the Inverted W have gotten the most press, when it comes to proper pitching mechanics, the most important thing is what I call Timing. By Timing, I mean the position of the pitching arm when the shoulders start to rotate. If you compare the position of the pitching arm of dominant and durable pitchers and frequently-injured pitchers at the start of the rotation of the shoulders, you can see an obvious difference. 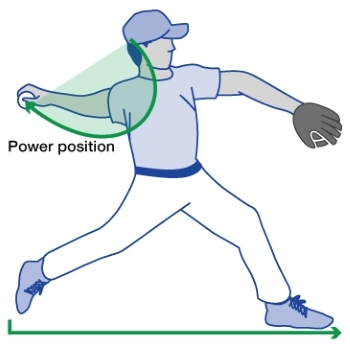 The pitching arms of dominant and durable pitchers are UP when their shoulders start to rotate -- which is usually at front foot plant -- and the pitching arms of frequently-injured pitchers are FLAT when their shoulders start to rotate. I use the term Flat Arm Syndrome to refer to the tendency for frequently-injured pitchers' arms to be flat at the start of shoulder rotation. Justin Verlander is probably the best current example of good timing and proper pitching mechanics, and I believe his getting back to his original mechanics helped to explain his success in 2016. The definition of proper pitching mechanics is changing, and I believe Timing problems are becoming more prevalent as a result and due to the proliferation of two cues. The most problematic cue is one that is, tragically, advocated by the Mayo Clinic as being part of the mechanics of a safer fastball. 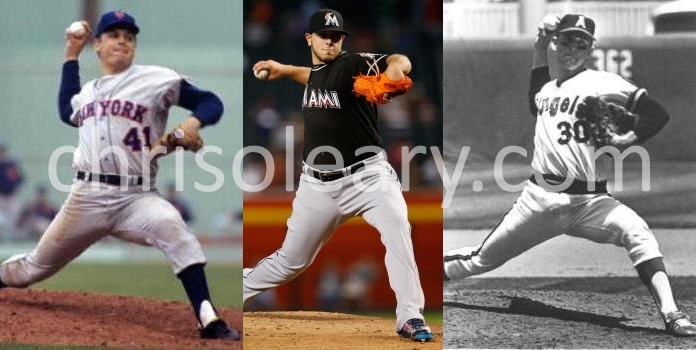 As I said above, if you look at the pitching mechanics of dominant and durable pitchers like Nolan Ryan, Justin Verlander, and Tom Seaver, their pitching arms are UP when their shoulders start rotating. What the Mayo Clinic is advocating is something you see in the pitching mechanics of frequently-injured pitchers like Henderson Alvarez. The obvious contrast between what Henderson Alvarez does (did?) and proper pitching mechanics made his injury problems sadly easy to predict. Point the ball at second base. Show the ball to center field. The idea of pointing the ball toward second base at the power position is advocated by USA Baseball, among others. I was taught that great pitchers do some variant of pointing the ball at second base. However, when I checked, I found that was not the case. However, if you look at pictures of pitchers who need Tommy John surgery, they are often pointing the ball at second base at foot plant. Every harder thrower doesn't get hurt. I believe I have identified the -- in my opinion unnecessary -- movement patterns that place them at risk. This is just an overview of my views on proper pitching mechanics. For an expanded version, see the essay on my client site entitled Proper Pitching Mechanics? It is part of my webbook that discusses the pitcher injury and Tommy John surgery epidemic.